PortaOne and Quintum Joint Seminar on the Products for Polish ITSPs. PortaOne and Quintum have held an information seminar on their products for Polish ITSPs today in Warsaw, Poland. 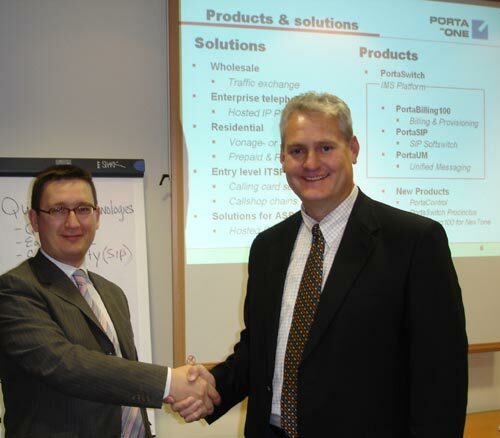 The seminar was organized by Telco Systems Polska, a local distributor of VoIP solutions and equipment. The Central European market (and the Polish market in particular!) has shown a great amount of interest in PortaOne’s billing and softswitch solutions as well as in the Tenor line of VoIP MultiPath equipment provided by Quintum. This seminar is another step in the development of the partnership between Quintum and PortaOne. Two companies have already shared booths at Internet Telephony and CommunicAsia shows. Quintum and PortaOne will also exhibit together at ITU Telecom World 2006 in Hong Kong, China on December 4-8, 2006. Please visit our booth 8019.007.